What this database is trying to model is a bunch of facts modeled as semantic triples. A semantic triple consists of two entities connected by a relationship. The entity object only has an id and name and a list of Attribute objects. This is so we can beef up our Entity over time, as we discover more properties for these objects, without having to change any code. Attributes are modeled as name-value tuples, and the AttributeType normalizes the attribute names, which are likely to be repeated across Entities. One thing we did before we go forward is to add reverse relationships. After the OWL file was parsed and loaded into the database, we ended up with about 9 relationship types. These represent one way relationships (such as subClassOf). Usually relationships are two way, so we manually set the reverse relationships with the id as the negative of the original relationId. The complete list of relationships is shown below. Of course, we need not put in relationships that don't make sense or that we don't want to expose. An ontology can be visualized as a forest of taxonomy trees, where the nodes of the trees are connected to nodes of other trees - in other words, a graph. So my next step is to convert this structure into an in-memory graph object so it can be navigated without having to resort to complex SQL. Searching for decent Java based graph data structures I could use, I came upon JGraphT, which not only provides standard graph data structures that can be used, but also has a large number of graph algorithms built into the package. I guess I could have cooked one up myself, since all I wanted to do was to model a graph and navigate it, but the advantage of using a standard data structure from a decent library is that the library author has already worked out the kinks in the data structure so it is likely to be more extensible. Moreover, while I don't need any of the graph algorithms built into JGraphT right now, it is conceivable that I will at some point down the road. So anyway, this post describes the code that I wrote to load a JGraphT Graph object from my database, and then hitting the graph with a few basic queries to make sure everything works. First the beans. I define an Entity bean, an Attribute bean, a Relation bean, and a Fact bean which models a semantic triple. These are simple holder classes. The overriden equals() and hashCode() methods on the Entity bean (above) are necessary - this is to enable JGraphT to locate it in the graph when we try to look for it with a reference to an Entity object. 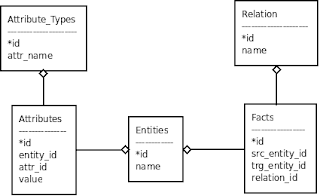 To connect Entities, we need an Edge object that can be labelled, so we subclass JGraphT's DefaultEdge and add in an additional property relationId. Here is the code for RelationEdge.java. * relationId that relates the entities the edge connects. Finally, we define the container class which ties this all together. The client will call methods on this class. To load this object, we use the DbOntologyLoader class, which calls methods on the DAO classes to retrieve data from the database. Here is the code for the loader. The loader depends on three DAOs for Entity, Relation and Fact. The code for these is shown below for completeness. * from lowercase to uppercase. * @param name the input camel cased name. * @return the "english" name. And here are the actual outputs (formatted for clarity) for the questions we (effectively) asked in our unit tests above, and the answers we got back from our ontology. query> where is Loire Region? query> what regions are in US Region? As my son would say -- "Cool, huh?" Where can I download the database for the test? I don't have the database downloadable, but here is the latest schema DDL. My previous post has code that reads the downloaded wine.rdf file and loads it into the database. Is it Possible to convert a database entry into a graph. Graph with Edges and Vertex Attribution. I need help in Attributed Graph Representation. I couldn't find any sample codes which could help me to create graph and adding attributed to V and E in JGraphT. Hi Xavi, I believe the last two comments may be yours? To answer your first question, this post loads a database into a JGraphT graph, so yes, I believe it is possible to convert set of database entries into a graph. To answer your second question, I am not sure what an Attributed graph is (and Google was not much help), but if you mean adding properties to vertexes and edges of a JGraphT graph, then I believe that is also possible. Since V and E are generic, you can define your own V and E with references to the properties you want on them. Just dropping in to say THANKS for the code. I've using it for some time now. It's a great starting point to build a simple ontology on top of jgrapht. Great job! Thank you Stefan, glad it helped. I do plan to do more work with neo4j in the future. Thanks are due, really helped out. Thanks OmarRouby, and you are welcome.